Processes involved in the development of igneous and metamorphic rocks involve some combination of crystal growth, solution, movement and deformation, which is expressed as changes in texture (microstructure). Advances in the quantification of aspects of crystalline rock textures, such as crystal size, shape, orientation and position, have opened fresh avenues of research that extend and complement the more dominant chemical and isotopic studies. This book discusses the aspects of petrological theory necessary to understand the development of crystalline rock texture. 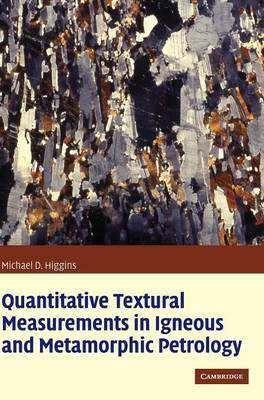 It develops the methodological basis of quantitative textural measurements and shows how much can be achieved with limited resources. Typical applications to petrological problems are discussed for each type of measurement. This book will be of great interest to all researchers and graduate students in petrology.